Mark DeCarteret has appeared next to Charles Bukowski in a lo-fi fold out, Pope John Paul II in a hi-test collection of Catholic poetry, Billy Collins in an Italian fashion coffee table book, and Mary Oliver in a 3785 page pirated anthology. He has been published in the anthologies: American Poetry: The Next Generation (Carnegie Mellon Press), Thus Spake the Corpse: An Exquisite Corpse Reader 1988-1998 (Black Sparrow Press) and Under the Legislature of Stars: 62 New Hampshire Poets (Oyster River Press) which he also co-edited. He has had some luck recently at 2 Bridges Review, American Journal of Poetry, Common Ground Review, The Doctor T. J. Eckleburg Review, Fence, Gargoyle, Map Literary, Mojo, and Timber. His latest book, For Lack of a Calling, was published over the summer by Nixes Mate Books. He was Portsmouth’s seventh Poet Laureate. Kathleen Clancy started writing poems with crayons before the age of 9. Her first mentor was Robert Cording, with whom she studied at Holy Cross College. After college she studied at the Frost Place in Franconia NH for 8 summers with poets such as Meg Kearney, Ted Deppe, Baron Wormser, and Jeffrey Harrison. 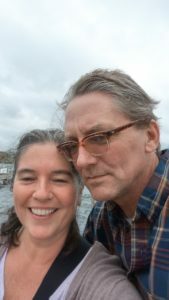 Kathleen got her MFA at the University of Southern Maine-Stonecoast, where she was drawn to continue her studies with those and other Frost Place poets, including Gray Jacobik and Jeanne Marie Beaumont. At Stonecoast, Kathleen also wrote formal poetry for a year with mentor Annie Finch. She most recently placed poems in Good Fat, Café Review, and Cider Press Review. In 2012, her sonnets were used as part of the text of a multi-media dance-drama, Shackled Spirits, which was performed at Holy Cross College and the Bali Arts Festival in Indonesia. She has lectured at Bryant College and interned at The Manhattan Review. She is a City Hall Poet and a founding member of the Connecticut River Advanced Conference on Poetry and Poetics, an annual event co-taught by participants that is based on the teaching and learning philosophies of the Frost Place Festival and Seminar, and particularly Donald Sheehan.